Better Buy: Franco-Nevada Corp. vs. Silver Wheaton Corp.
You'd be surprised to know how rapidly one of the precious-metals streaming companies is growing. If you're looking for exposure in precious metals, you can either invest in mining stocks or go for streaming companies like Franco-Nevada Corp. (NYSE:FNV) and Silver Wheaton Corp. (NYSE:SLW) that run an offbeat business of financing miners and buying metal streams from them in return. Given how these streaming stocks have historically outperformed their mining counterparts like Barrick Gold (NYSE:GOLD) and Goldcorp Inc. (NYSE:GG), there's never a bad time to invest in them. In fact, investors could easily consider initiating a position in Silver Wheaton or Franco-Nevada now as there appears to be a lot of steam left in both. One stock is still down about 10% and the other up only about 3% in the past six months even after their strong recent run-ups. Of the two, one stock looks particularly compelling right now based on three key aspects. Franco-Nevada and Silver Wheaton have just come off a solid financial year, with both companies reporting record production and revenues for 2016. As you may already know, these companies don't own and operate mines but depend on miners to secure precious-metal streams. Franco-Nevada's growth in 2016 can largely be attributed to its newly acquired streams, especially the South Arturo mine, operated jointly by Barrick and Premier Gold Mines; Antapaccay mine, operated by Glencore; and Antamina mine, partly owned operated by Teck Resources. Silver Wheaton's story is slightly different and interesting: It's gold, and not silver, that's fueling the company's growth. In fact, its silver production declined in 2016, and if not for the surge in gold deliveries from Vale's Salobo mine, Silver Wheaton might've ended the year on a disappointing note. Silver Wheaton had extended its agreement with Vale to buy an additional 25% of the gold produced from Salobo for the mine for life in August last year. When it comes to operating margins, though, Silver Wheaton not only leads the streaming pack -- which also includes Royal Gold (NASDAQ:RGLD) -- but also handily beats some of the largest mining companies. Much of it has to do with Silver Wheaton's incredibly low purchase costs, which have averaged $4 per ounce of silver and $400 per ounce of gold. 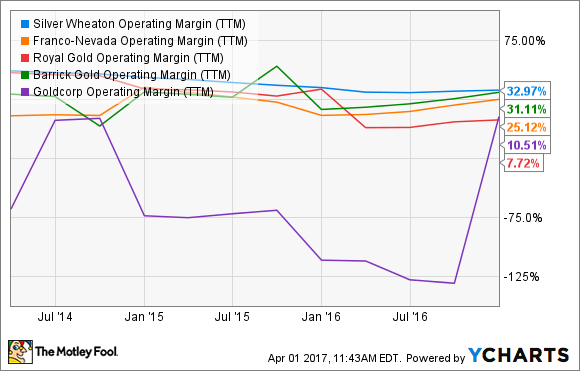 SLW Operating Margin (TTM) data by YCharts. The picture looks different when you pull up the growth trends in the streamers' profits and cash flows in recent years: There's no denying Franco-Nevada's solid growth. After all, cash flows matter more to a shareholder than margins. 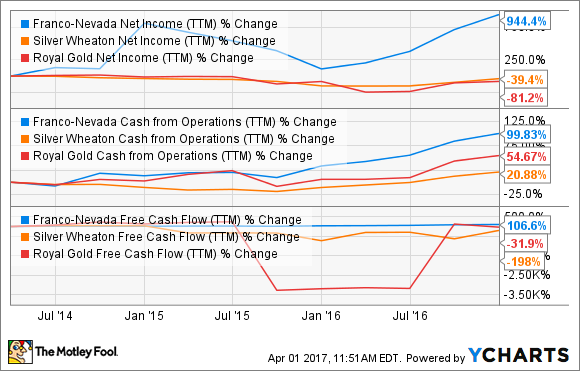 FNV Net Income (TTM) data by YCharts. Two things might be working for Franco-Nevada here: larger exposure to gold, which accounted for 70% of its total revenues last year, and a more diversified portfolio -- it derived 5% revenue from oil and gas, and 6% from platinum group metals last year. Both Franco-Nevada and Silver Wheaton have given out long-term production estimates, and this is where things get really interesting. Franco-Nevada expects to generate 515,000 to 540,000 gold equivalent ounces (GEOs) by 2021. That's roughly 14% growth at the midpoint from 2016, which was a record production year for the company. Silver Wheaton estimates its silver production to average 29 million ounces and gold to average 340,000 ounces between 2017 and 2021. Franco-Nevada's gold and silver price assumptions through 2021 give us a silver-to-gold ratio of 68.57. Extrapolating that into Silver Wheaton's average production estimates for the next five years gives us GEOs worth about 763,000 ounces. That's about a percentage point lower than 2016 levels. In other words, while Franco-Nevada's production is expected to rise, Silver Wheaton might barely be able to offset declining silver production with its oncoming gold streams. So far, I haven't even considered the growth potential in Franco-Nevada's oil projects. It is acquiring $110 million worth of oil and gas royalty rights in the Midland Permian Basin after acquiring $100 million worth rights in the emerging STACK play in Oklahoma last December. These two transactions leverage Franco-Nevada to growth opportunities in eight out of the top 20 active oil counties in the U.S., and as a result the streamer's oil and gas revenues could grow more than threefold in the next decade. Franco-Nevada and Silver Wheaton both yield 1.3% in dividends currently. 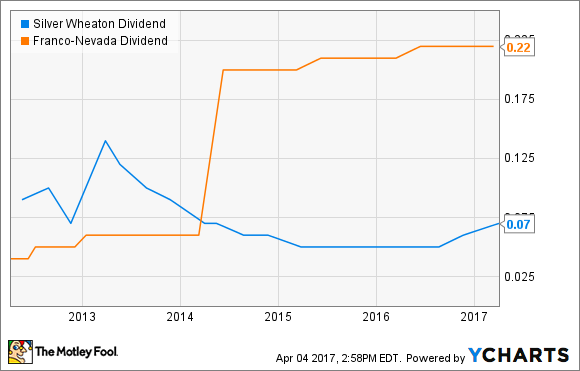 But one chart reveals which is a better dividend stock. SLW Dividend data by YCharts. Clearly, Franco-Nevada's dividends have not only been more stable than Silver Wheaton's but have also grown at a stronger clip in recent years. I don't think you need any more reasons to consider Franco-Nevada over Silver Wheaton today. Silver Wheaton is more reasonably priced at 16 times cash flow versus Franco-Nevada's P/CF of 25, but I wouldn't mind paying a premium for a company that is sitting on such solid growth opportunities.